Chicago Supply Chain and Sustainability Summit attendees fill the room at the Four Seasons Hotel in Chicago. More than 300 people from 100 organizations attended the 5th annual Chicago Supply Chain and Sustainability Summit on October 17, 2016. 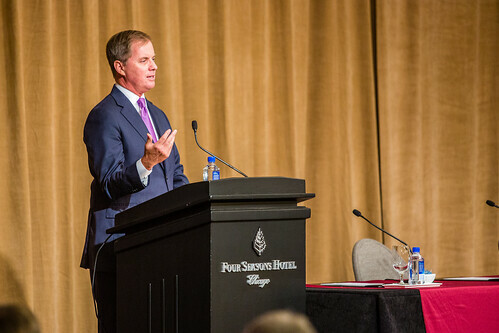 Held at the Four Seasons Hotel in Chicago, the summit featured industry leaders from organizations including The Home Depot, Mattel, and A Safe Haven Foundation discussing supply chain operations, sustainability, social enterprise, economic development, and other critical issues in supply chain management. In addition to the presentations and panels, supply chain professionals and Loyola students were recognized during the summit. The Supply and Value Chain Center recognized the summit’s three featured speakers by creating $2,000 student scholarships in each of their names. Following the formal presentations, attendees enjoyed a reception in Wintrust Hall in the Schreiber Center, the new home of the Quinlan School of Business in downtown Chicago. The summit is hosted by Quinlan’s Supply and Value Chain Center, a member of the Loyola Business Leadership Hub. View summit photos in the gallery below or on Quinlan’s Flickr page. Livingstone shared how The Home Depot’s transportation team has adapted to support the explosive growth in their business including on-line channel. She candidly described what she believes is at the heart of The Home Depot’s success: the “inverted pyramid” approach that puts customers and the store-level associates who help them first, while the role of everyone else is to support those efforts. Livingstone then challenged attendees to increase diversity across all levels of the supply chain. Supporting products including Barbie, Hot Wheels, and the newest toys tied to major movies calls for a very segmented and flexible supply chain that can ramp up production quickly. Lambotte described the unique supply chain challenges in the toy and fashion industry and shared solutions, including a mix of automation and manual manufacturing. Mulroe discussed the work of A Safe Haven, a social enterprise that provides individuals who are homeless opportunities and coaching to enable them to transition to self-sustaining, productive lives. In addition to the social benefits, this provides a critical source of labor given the current and anticipated talent shortages in the supply chain. During the summit, the Supply and Value Chain Center recognized the outstanding performance of individuals and teams in the supply chain industry. The Loyola Business Leadership Hub awarded $2,500 scholarships to five Loyola University Chicago students who plan to contribute to sustainability and supply chain improvements through their career.